1. One 2-inch mesh per plant, if necessary. 2. One 1/8-inch fitting per plant. 3. One piece of 1/8-inch tubing per plant that is connected from header line to container. 5. Four-inch PVC pipe that is cut to equal lengths that are used to hold the plants. 8. 1/2-inch black poly tubing for header lines. 9. 1/2-inch black poly elbows. 10. 1/2-inch black poly Ts. 11. 1/2-inch black poly end caps. 13. 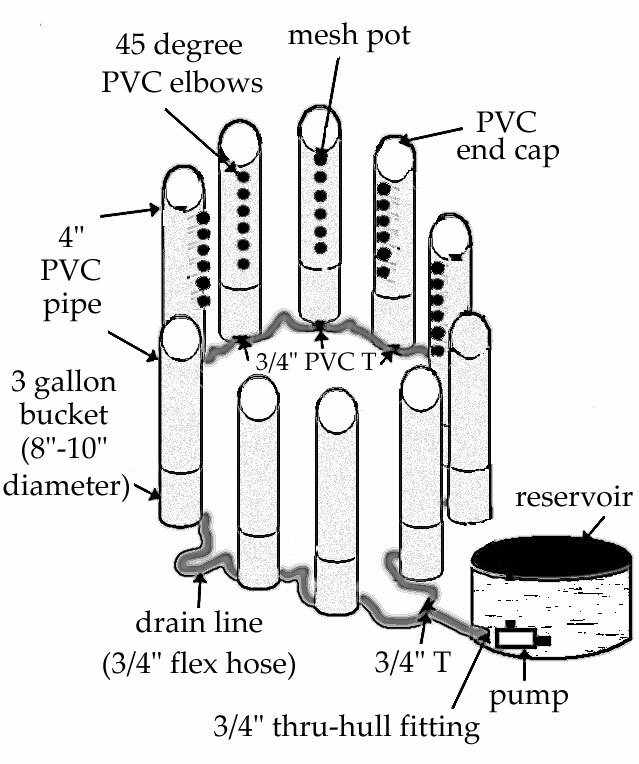 One 3-gallon bucket per pipe. 5. Custom-sized holesaw (i.e. 31/2-inch) for plant containers, if necessary. In most cases, this system is used to grow small plants. Seedlings can be induced to flower at 5 weeks old, or clones that have reached a height of 6 inches. Typical uses for this system are 12 pipes at 8-inch centers or 10 pipes at 10-inch centers using three 400-watt lights. Or 28 pipes at 8 i nch centers, or 24 pipes at 10-inch centers using two 1,000-watt lights. But a grower can use half of the pipes described above and double the spacing to grow midsize plants. This system is a fast, cheap, and easy column system to build. This system will use a medium like soilless mix in the pipe. Soilless mix is the easiest choice. The feeding in this system can be done continually, or for 2 minutes every 20 minutes. A. First you’ll need to choose the desired pipe. 4 to 8-inch PVC is a good pipe to use. 4-inch is the cheapest but larger pipe is easier to use because there is more room for the roots. To keep things simple, these instructions are with 4-inch PVC. The 4-inch piping is glued with PVC cement to the 4-inch PVC elbows so that the space is 8 to 10 inches center. 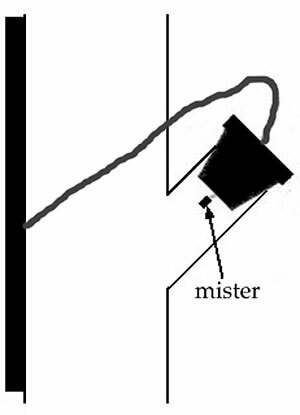 A hole should be made just below the height of the 3-gallon bucket to drain the solution. 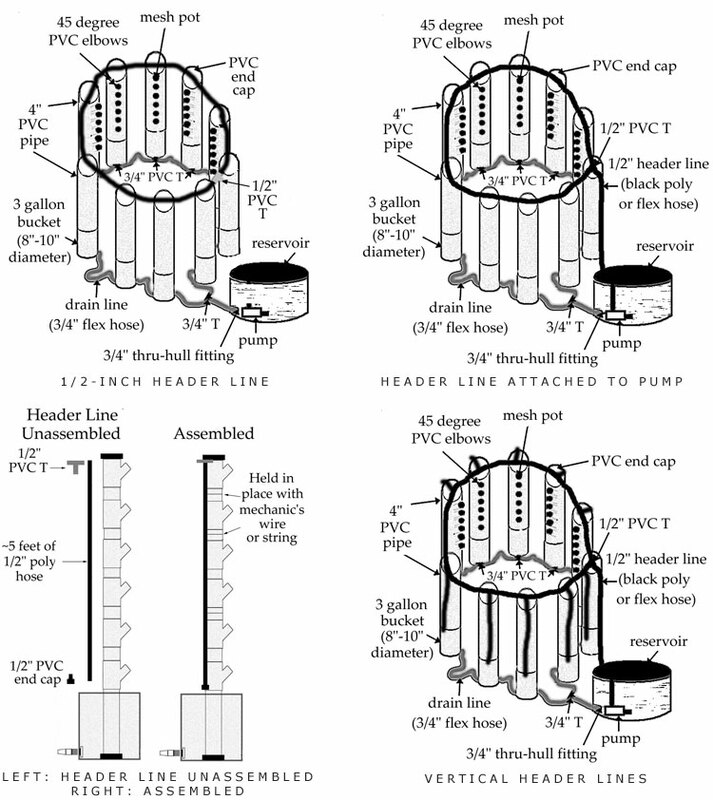 (Figure 4.128) The buckets should have a diameter less than the center spacing of 8 to 10 inches. H. Each bucket lid should have a hole made into it to fit around the pipe. The lid will add extra support to the pipes and make for less water loss through evaporation. 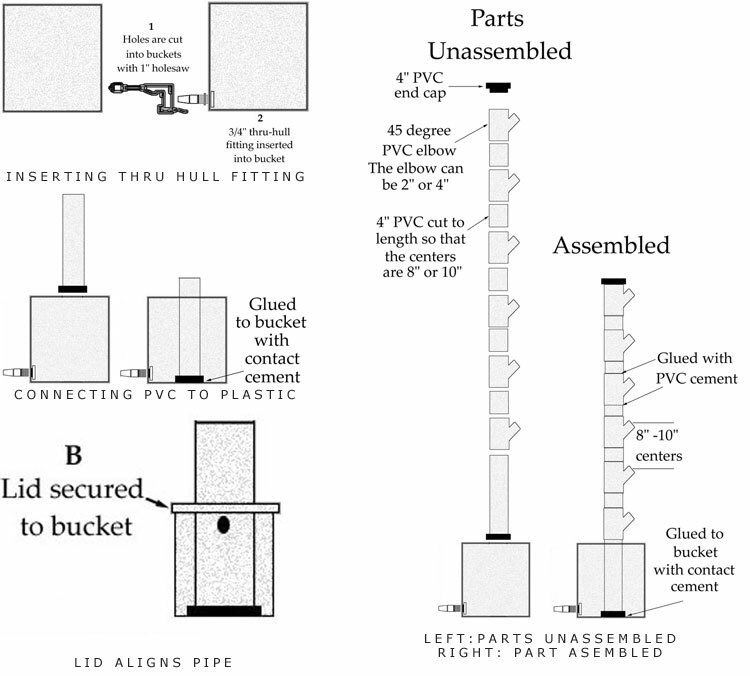 The lid can be placed on the bucket when the glue is dry. Holes can be made with a 4 1/4-inch holesaw, hacksaw, or jigsaw. I. 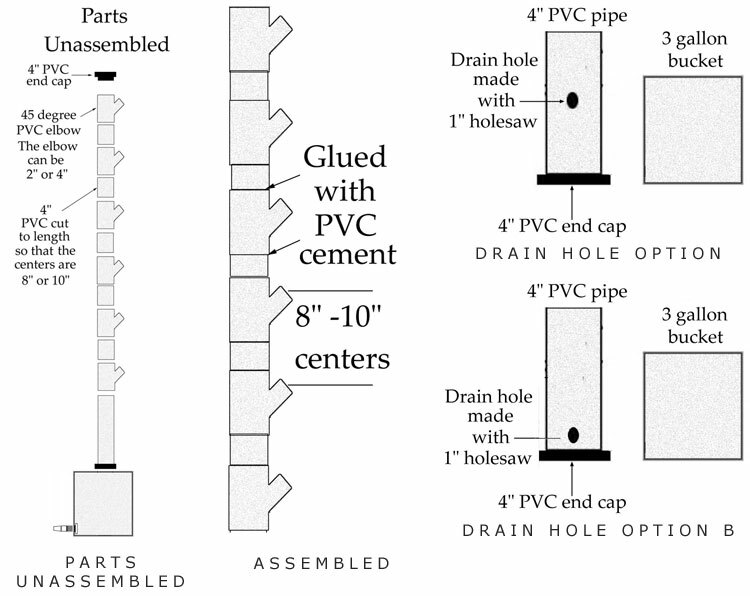 The columns can be glued with PVC cement to the 4-inch pipe. 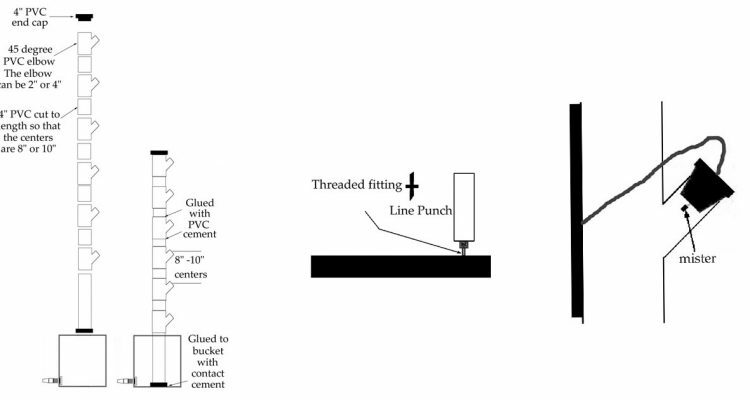 (Figure 4.133) The columns can be on the same side or opposite side as the thru-hull fittings. O. 1. A long piece of 1/2-inch poly tubing should run along the tops of the pipes until it reaches the last one in the circle. 6. The poly tubing is connected to 1/2-inch PVC end caps. 7. Holes are punched and appropriate connection fittings are inserted, such as 1/8-inch fittings for 1/8-inch lines. One fitting is used for each plant. 9. 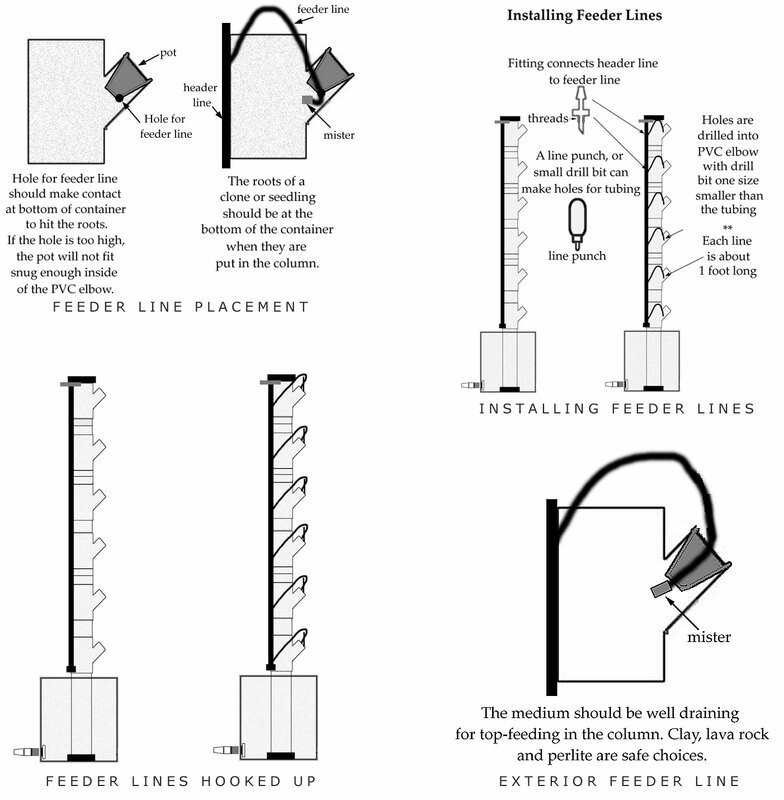 Lines are then connected to alligator stakes. A bypass valve can be inserted be-tween the pump and the first 1/2-inch PVC elbow. 1. A 1-inch chunk is cut out of the 1/2-inch poly line. 2. A 1/2-inch PVC T is inserted into the cut out section. 3. A 5-inch chunk of 1/2-inch poly plastic is connected to the 1/2-inch PVC T.
4. A lightweight plastic tap is connected to the 5-inch chunk of 5-inch black poly piece. Q. Lights are hung in between the plants without hoods. For example, three or four 400-watt lights ( 2 to 3 sodiums and 1 halide) can be placed on top of each other to illuminate the plants grown in 6-foot high pipe. R. It is easiest to feed the plants with the pump timer running full-time, only during the light hours. But, plants can be fed continuously (all day and all night). Also, plants can be fed intermittently (i.e. every 20 minutes for 2 minutes, every 2 to 5 minutes for 30 seconds) during all hours. Detailed feeding options and instructions are provided in chapter 5. 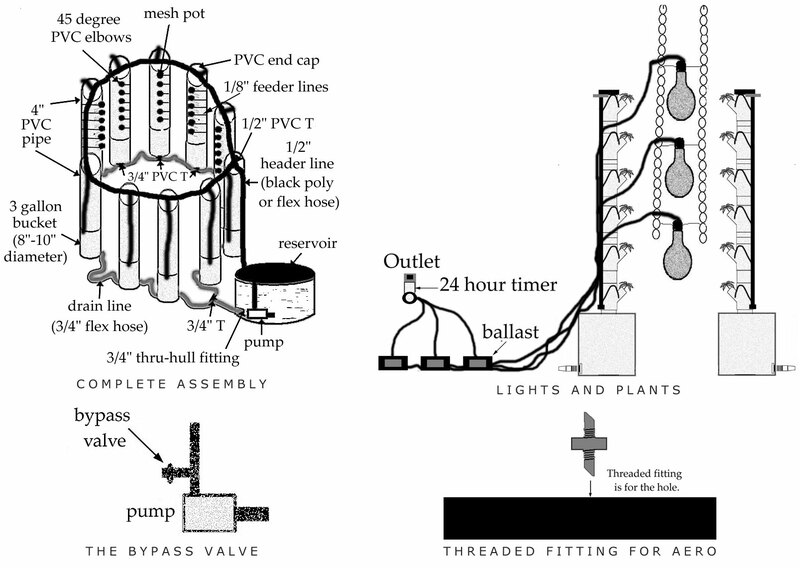 Making the aeroponic version of this system is easier than making the top-feeding system. B. A new piece of identically sized 1/2-inch hose is cut. C. The 1/2-inch end cap from the old tubing is put in one end of the new tubing. F. The pump should be changed to a high-pressure pump designed for aeroponics. The pump should be the size required for the garden dimensions. A 1,200-gallon per hour pump will work with 11 to 13 PSI misters. High-pressure pumps are available at hydroponic stores, water supply places, and on the Internet.